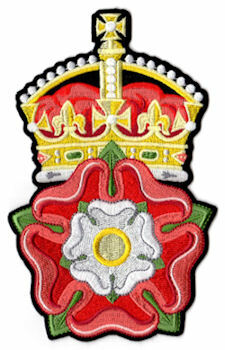 Beautiful, intricately designed crowned Tudor rose badge. Mounted on black twill so that you may easily baste the emblem to the garment of your choice. Perfect for Yeoman of the Guard, banners, flags, table runners, or whatever you wish. Made of high-quality embroidery flosses. Measures 6" x 3.8". Made in the USA.